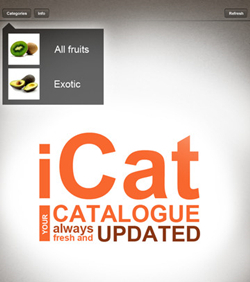 iCat is a new iPad application directed to the B2B market and dedicated to the managing of product / service catalog. iCat is an iPad App, free in its base version and without managing costs, which refreshes online and works offline also. – For consumers: a funny way to browse the product catalog through an enjoyable, cool and cutting-edge device as the iPad. iCat Catalog: a new sale and purchase experience. The iCat’s main features allow to update catalog data; to present company profile; to browse categories and products, to which are associated technical cards with high definition photos, customized contents and detailed description. iCat app allows user to manage autonomously hierarchy categories of products or services, photos, product code, description of products or services. Moreover is planned the possibility of customization, including the upgrade to B2C . In addition to the base version, next updates allow to complete an order online, to associate it to a customer, to save and send it online to a reserved web server. It’s also possible to develop a multi-catalog for single device. Working offline, speed and immediacy of navigation through the catalogue, high-definition content such as photos, platform-independent data retrieval, update of data with the touch of a finger, easy to maintain and update data, navigation interface iPad friendly, homogeneity of the data for the sales network and distribution, cross sales data, independence from the corporate sector and product or service offered. Internet coverage required only for updating data residing on the catalogue. Download the app from the App Store using iTunes. tap on “Info” button on iCat app, copy the device id; login at www.icatapp.com, insert it on the “devices” section. Touch the “Refresh” button on iCat app, and start presenting! Pocket: allows you to save articles, videos and more for later. So you can view it on your iPhone . You don’t even need an Internet connection. Spying apps: allow you to monitor any iPhone you own from your computer or mobile device. Great apps that can help keep your kids safe online. Wave: Free software & business management tools for small businesses. Easy to use. Unlimited income and expense tracking.